A-1 Guaranteed performs home energy performance audits to help families and businesses make sure they are operating efficiently and cost-effectively. At A-1 Guaranteed we take a house as a system approach to all our HVAC and retrofit work. As prescribed and recommended by the Building Performance Institute, our process concentrates on indoor air quality, safety, energy savings and true comfort.We know that a house works as a system each component performing to create a comfortable, safe and energy efficient home. Instead of just considering one piece of the puzzle such as the furnace we look deeper, considering insulation , infiltration (air leakage) , window systems underfloor moisture issues and more. This thorough house as a system approach is beyond what average Heating and Air companies even understand. The performance of each system is directly connected and closely related. When one portion such as the building shell is inadequate to contain the conditioned air this directly causes overuse of the mechanical system I.e the heating and air. When the shell is loose ( air leaks) this can cause irregularities in the inside pressure drawing in dirty unconditioned air from underfloor and attic areas. Proper insulating and sealing of the building shell as well as proper sizing and installation of the Heating and Air Conditioning equipment will prevent this common problem and dramatically improve indoor air quality. Our comprehensive home energy audit will pinpoint the trouble spots and allow us to focus on the real issues that are causing your comfort concerns. The audit considers all the factors that play a part in your homes performance as a system. Once the audit is complete we will make recommendations based on your actual real time efficiency and we will offer solutions based on the options you consider to be the most important. Perhaps your old unattractive drafty windows or that out of date energy guzzler furnace. You can be sure with A-1 Guaranteed we will provide you with a upgrade that fits your budget and dramatically improves your homes comfort. The benefits are many when you take the whole house as a system approach, you will see improvement in your energy use, drafts will be diminished living spaces will be more comfortable with even temperatures throughout, and you can be sure that your home will be safe from the silent killer carbon monoxide. Your safety is a primary concern as we perform your upgrade we are on the hunt for any unsafe conditions in your home. We provide the safe home package with all of our performance upgrades Smoke and Carbon monoxide detectors and whole house earthquake gas shut off valves. Before we do any work in your home we will perform a full energy and comfort analysis. This comprehensive test will show us just how your home operates as a system. We will focus on health, safety, energy efficiency durability and comfort problems. We will ask about drafty areas, rooms that don’t heat or cool properly moisture problems odors and high energy costs. This information is key when planning a real world solution and plan of attack. Once the audit has been performed we will provide you with a report that itemizes and prioritizes the recommended upgrades along with modeled energy benefits. Then we meet with you to discuss the options and plan the improvements. Combustion appliance testing. Water heating, furnace, stove all will be tested for proper venting under best and worst case scenario conditions. We will also check for gas leaks in the equipment areas of your home. Building shell analysis. We will crawl the attic and inspect the underfloor to get a first hand view of these critical areas. Checking insulation quality and R value, exhaust fan connections , attic ventilation pathways, duct work quality and efficiency, air bypasses, interstitial cavities knee wall insulation and more we often find areas that minor repairs can make a major difference. Infiltration Test. Using a blower door. We identify the air leakage rate of your home and compare it to the actual recommended building airflow standard, a number that considers many factors including your homes location and building type. This test shows us how much air moves through your home and where it is moving. We can also through this test determine how and where to seal to get the most benefit for reducing energy use. This test is also critical in proper sizing of the Heating and Air system and is considered in less than 1 in 1000 Heating and Air projects due to the shortage of trained contractors. This is why we always recommend a full audit when performing an HVAC upgrade. Infra Red Camera inspection. This high tech camera can see inside your walls ceilings and floors. Reacting to temperature differences we can literally see your energy dollars seeping out of your walls. We perform this test with your house in negative pressure focusing on the walls , ceilings and floors it will show failed or inadequate insulation hot spots, pinpoint those mystery drafts that get your feet cold in the winter and the spots that heat your house up in the summer. This test is critical for real comfort. HVAC system analysis. Heating Ventilation and Air Conditioning. deadly carbon monoxide into your home. This test can also help us predict the life left in your system. 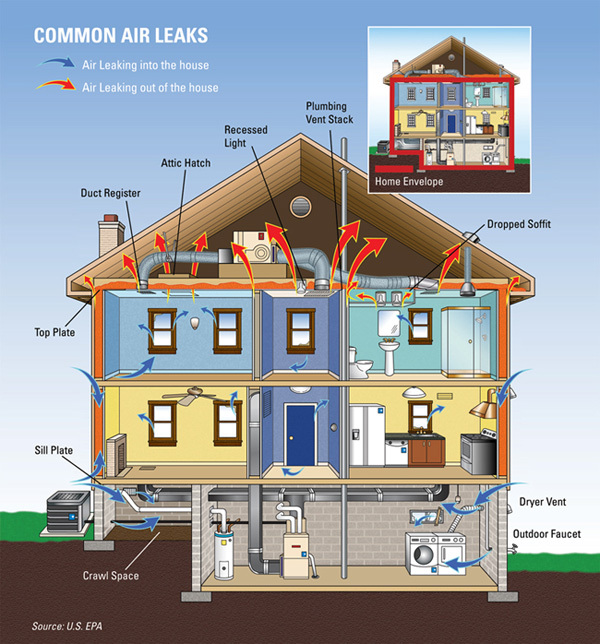 system pulls in air from leaks pulling in dirty unconditioned air causing dangerous indoor air quality problems and comfort robbing pressure imbalances. during this test we also record heat rise and actual BTU production. negatively effecting the static pressure. As you can see the whole house approach is completely different that the typical HVAC contractor approach. By looking at the house as a system we can solve many problems that in some cases may be made worse by only addressing a part of the big picture like a new furnace. Often times we find that Heating and Air systems do not need replacement, ductwork and insulation can often help more than a fancy new system and be a much more affordable upgrade.